A moose attacked a woman in Utah, officials say. And now they’re looking for where the victim went. She was too hurt to give her name at the time; wildlife officials are trying to track her down. 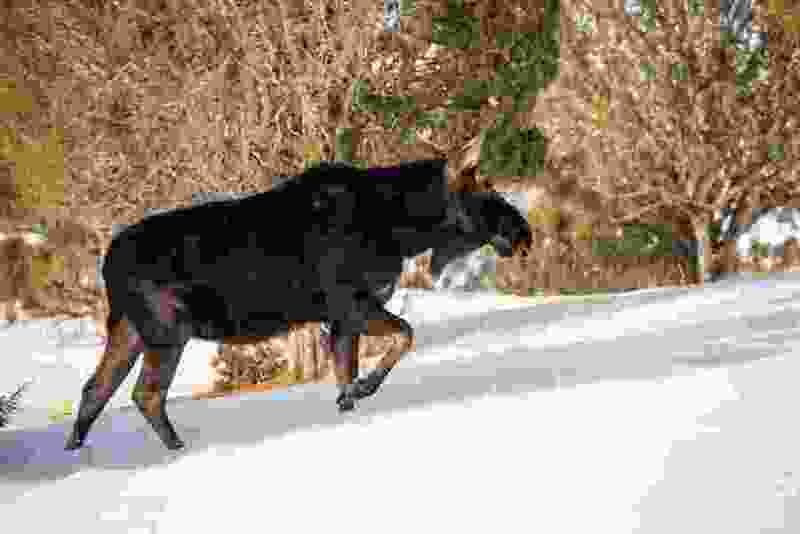 Courtesy | Utah Division of Wildlife Resources A bull moose was relocated after it wandered into Provo on Friday January 22, 2016. A moose was the likely culprit after hikers found an injured a woman on a Summit County trail over the weekend, a Division of Wildlife Resources official said Wednesday. On Sunday, two hikers were walking on an unnamed trail, created by locals on the northern outskirts of Jeremy Ranch, when they came across the woman lying in the path, said DWR spokesman Mark Hadley. About 20 feet away, the hikers saw a moose cow and her calf. The moose cow “made an aggressive movement” toward the hikers, who worried the animal might charge them, Hadley said, but it didn‘t. The hikers took the injured woman and her dog, which was not injured, to safety and called police. A DWR officer was called to the scene in the afternoon, Hadley said, and at that point the woman was being loaded into an ambulance. The woman was “injured enough that she wasn’t able to share her name” with emergency personnel, Hadley said. There were no witnesses to her injury, Hadley added, and the hikers didn’t know how long the woman had been lying in the path when they found her. The officer spent more than an hour searching the area for the moose and calf but didn’t find either, Hadley said. Based on the hikers’ accounts, the DWR believes a moose had attacked the woman. Officers tried to contact the woman, Hadley said. They likely won’t be able to talk to her unless she comes to them; most DWR officers are busy patrolling for the deer hunting season. The area is known for having a “healthy population” of moose, according to Hadley, and it wouldn‘t be surprising for hikers to come across the animal. Moose generally are found in the northern half of the state, where temperatures are lower than the south, though attacks are uncommon. Typically, moose cows are more aggressive than normal when trying to protect a calf, Hadley said, and bull moose, which “can be a bit ornery” under normal circumstances, are especially aggressive during breeding season, which is from late September to mid-October. Adult moose generally weigh between 800 and 1200 pounds, Hadley noted, and have shoulders that are about 6 feet tall. They move quickly, he said. If people come across a moose in the outdoors, Hadley said, the first thing they should do is back up and give the animal space. Pay attention to the animal’s behavior, Hadley said. If its ears stand up, if the hair on the back of its neck is lying down or if it starts to lick its snout, those are signs that the moose is agitated. If a moose is agitated, Hadley said, people should not turn around and try to run away — that could elicit a negative response from the moose. “Face the animal, and just slowly walk back the way you came,” Hadley said. If a moose does begin to charge at someone, the person should try to get behind a solid object, like a tree, to block blows from the animal, he said. And “if a moose knocks you down, curl up in a ball and try to protect your head,” Hadley said. Though some animals might be deterred when someone tries to fight back, moose are not, Hadley said. Fighting back likely would aggravate a moose further. For more information on Utah wildlife behavior and what to do when encountering animals in the wilderness, Hadley recommended that people visit wildawareutah.org.